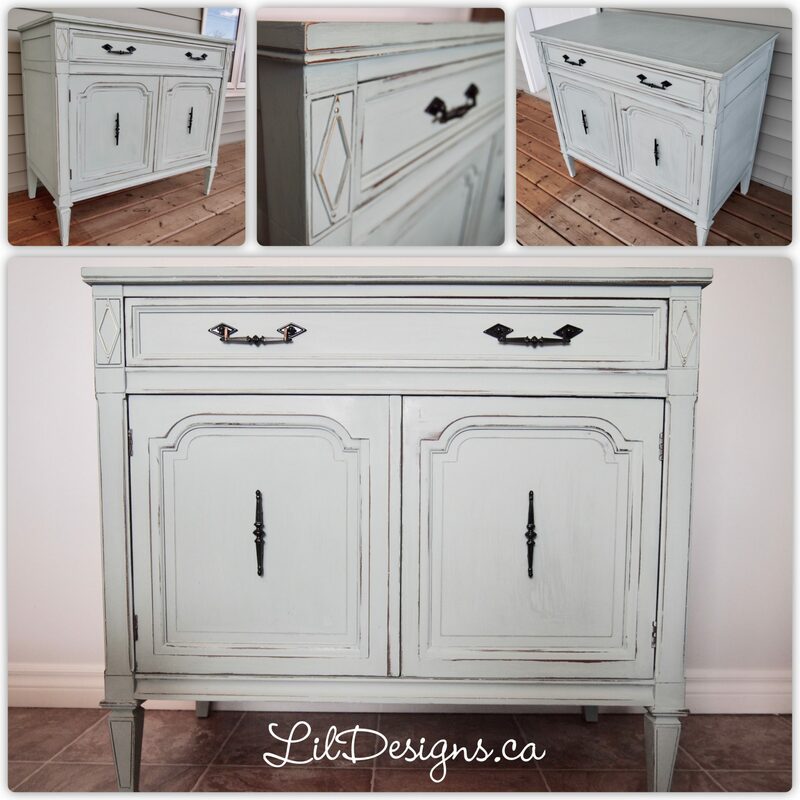 The lovely 1 Drawer 2 Door Accent Cabinet is brimming with charm and will become a treasured accent in any room you set it in. The distressed details and duck egg colour finish give this lovely design a touch of character while the patine accents corners on the drawer fronts and chic decorative hardware give it elegant appeal. Set this sophisticated cabinet in any room or suite for the perfect place to stow fresh linens. 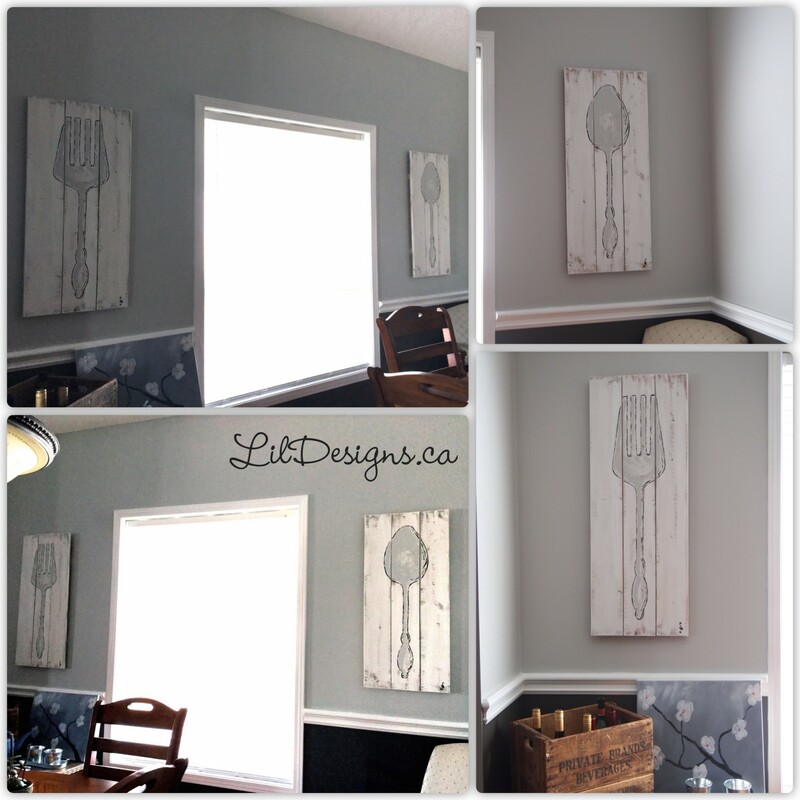 Or try using it in the living room or the den to add a pop of style! 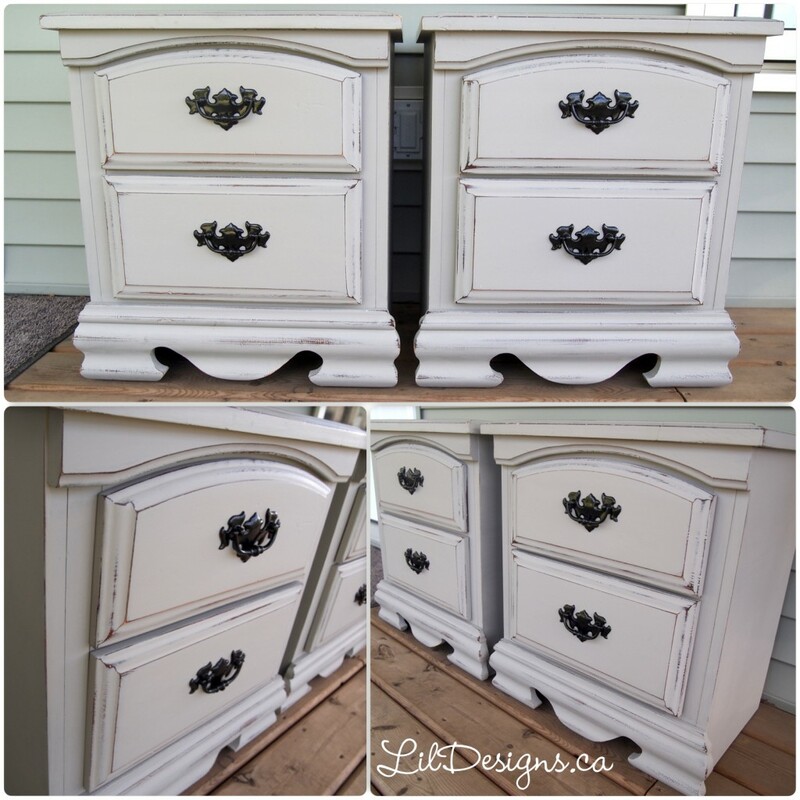 Another curb side find brought back to life to add some Spring colours into your home. So hubby and I are working on an upcoming project for a dear friend and I wanted to test out some stain colours before using it on the piece itself. What better way but to build something useful! I’ve been wanting a console table for a space in my foyer but could never find something to fit the space. 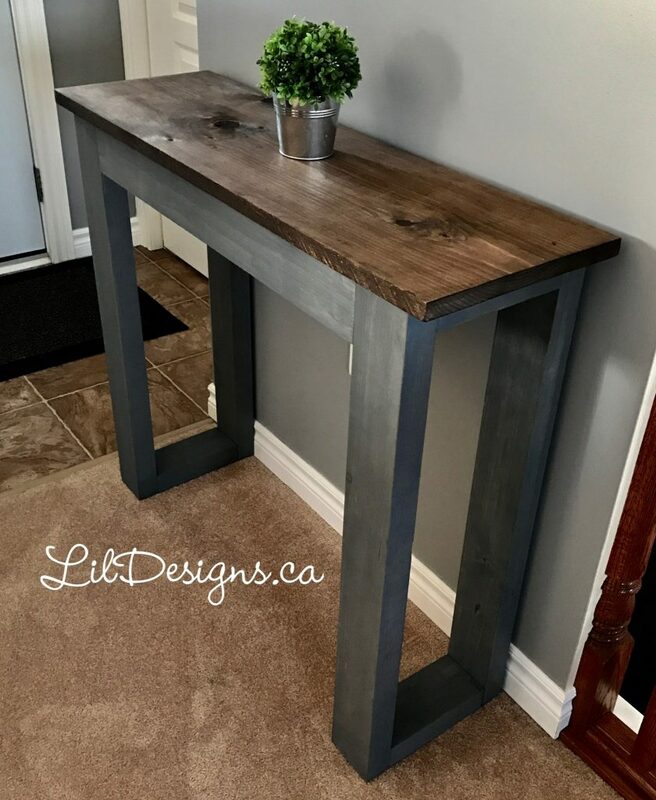 This entry was posted in Crafts & DIY and tagged console table, diy, furniture, kona, varathane, weathered grey, wood work. Sunday Fun-day!! What better way is there to spend time inside on this lovely snowy day… My dear friend Jenny brought back a few styrofoam rim spacers from her work to make some DIY projects and wreath. I couldn’t resist when she offered me one. You can actually buy the wire frames form Michaels or Canadian Tire for about $10. Or I’ve also seen others use pool noodles you can purchase at the dollar store as well. Unfortunately, I didn’t take pictures throughout as my camera batteries were dead. 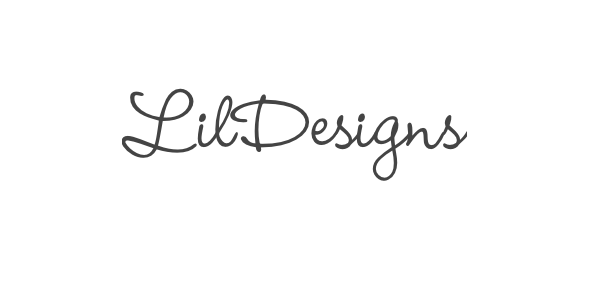 – Hot glue the pine cones also at random & add ornaments to you liking and you are done! To hide the string to attach the monogram, I’ve added a bow at the top right corner and simply tied it to the frame. Using another string, I made a loop so that I can hang the finished wreath. 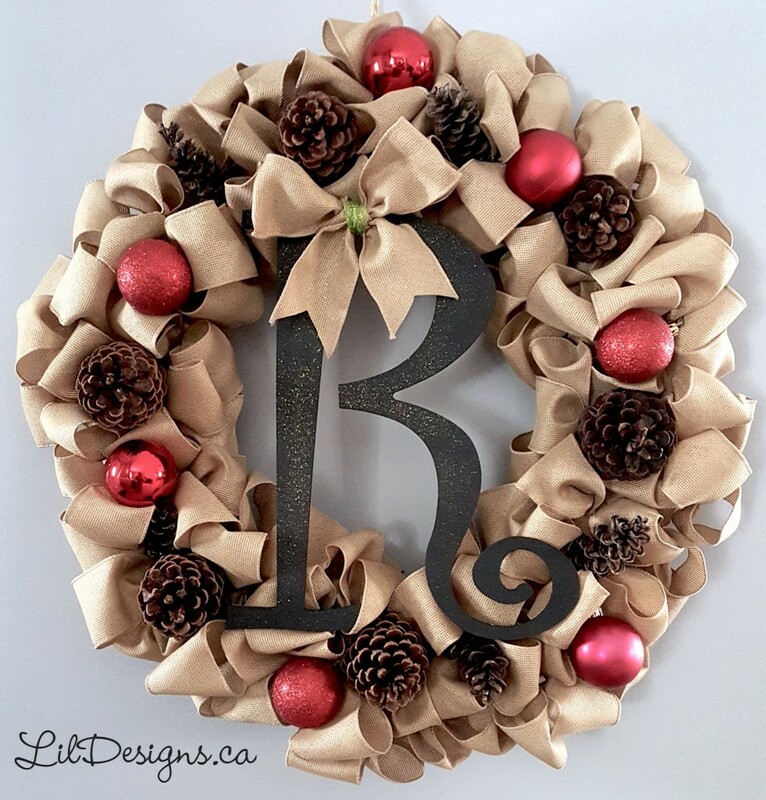 This entry was posted in Crafts & DIY and tagged Christmas, dyi, holiday, sunday, wreath. Rustic? Antique? Duck Egg & Chicken wire??? A combination perfect for a beautiful display cabinet. This little piece was picked up at an auction last winter. The glass pane was missing and it looked in dire need of a make over. With a little bit of elbow grease, some chicken wire, installed by hubby-extraordinaire and some Duck Egg ASCP paint and it was brought back to life. I also added a crystal knob to add just a little touch of chic. Isn’t it beautiful!! It’s been a while since I’ve posted. The last few months have been pretty hectic. Hubby and I moved to the country, north of the GTA and we’ve never been happier. Yes, the commute to work is a little longer but coming home every day is like going to the cottage. The air is cleaner, the people are friendlier and we’ve gotten to meet more neighbours than we have in the past. Like everyone is saying around here… in a small town like ours, everyone is your neighbours. 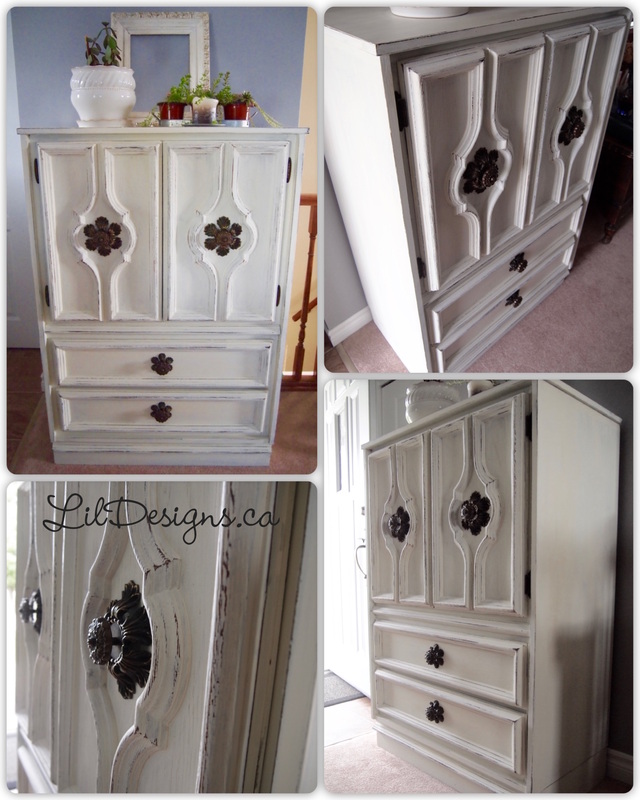 This tall boy was refinished in an Old White ASCP, the distressing made richness of the original piece pop. I had pondered replacing the hardware to give it a more modern look but the originals were just perfect for it so I left them as is. 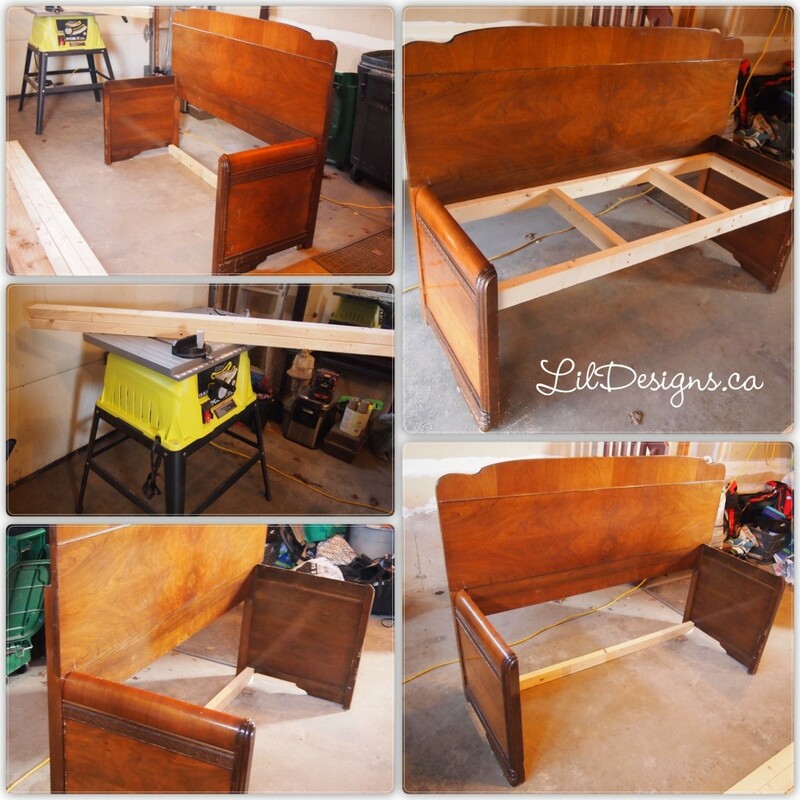 So I’ve always wanted to tackle the headboard repurposed into bench project. Luckily, I married a wonderful handy-man who loves to help with my projects. We’ve picked up this old but still very solid headboard and it sat in the garage for a while waiting for some inspiration. Hubby picked up some 2×4’s and started at it. After building the frames for the seat part and bottom shelves, he just added some slats and voilà! 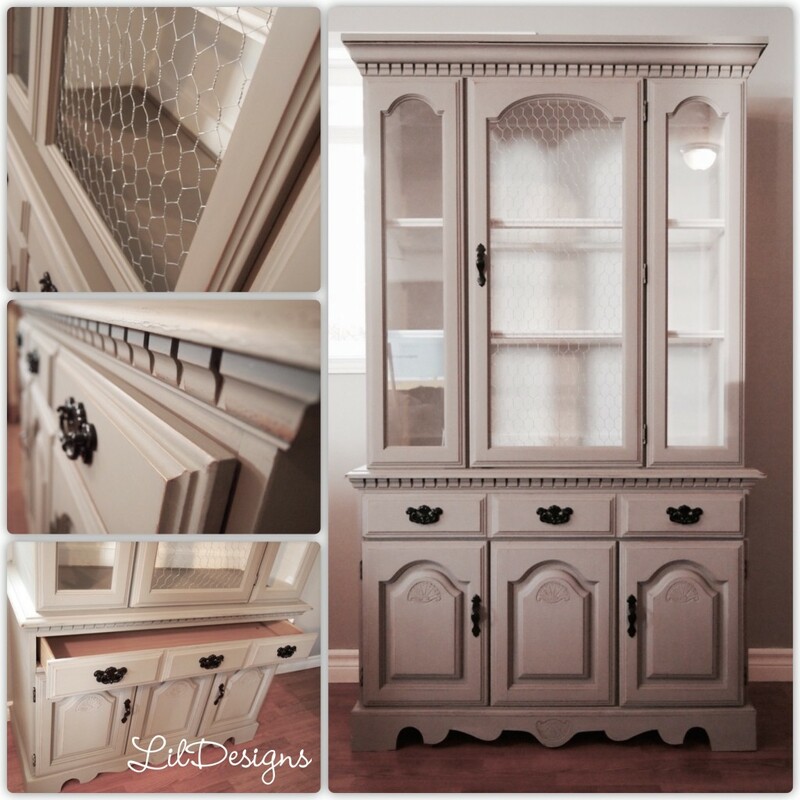 Once all of it was assembled, I painted it in an Annie Sloan Old White chalk paint to give it a country feel. I decide to white wash paint the boards for the seats to give it an even more aged look, which turned out beautifully. I love the details on old headboards, they surely don’t make them like this anymore. Distressing those areas really made a big difference and gave this piece some depth. 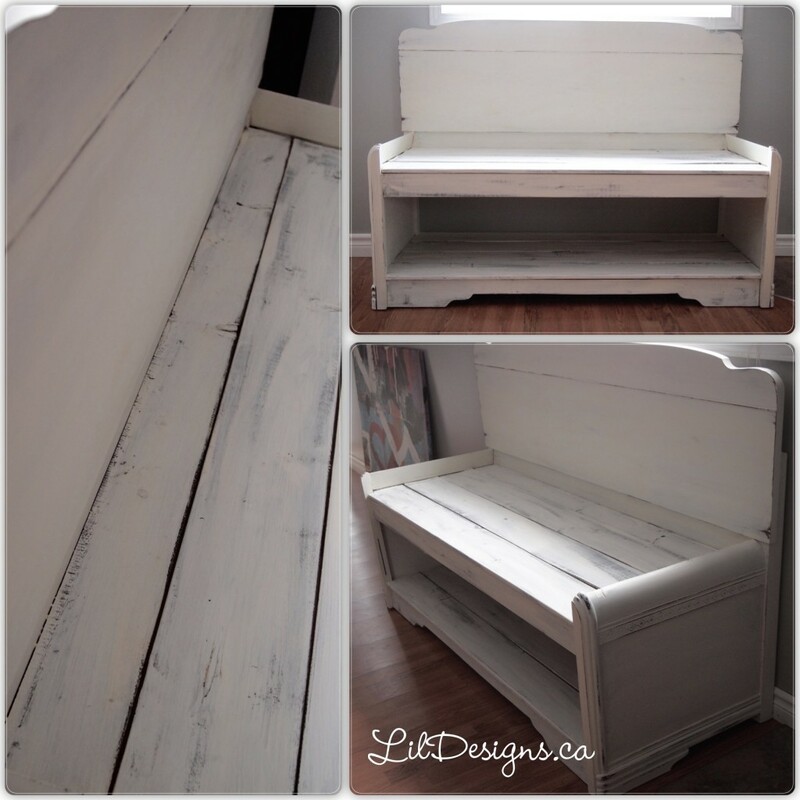 This entry was posted in Crafts & DIY and tagged annie sloan, ascp, bench, chalk paint, distressed, headboard, old white, repurposed, wax. So now that the nice weather is here, I don’t quite spend much time indoors working on pieces. Although I’ve had this urge to do a piece with chicken wire after seeing it done time and time again on Pinterest. 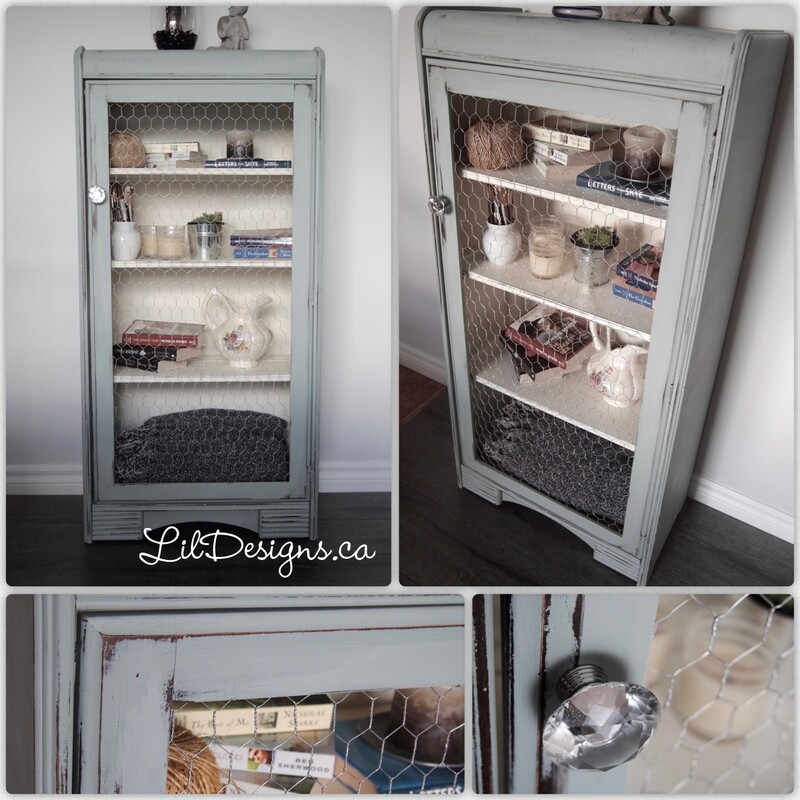 It just gives the right amount of rustic and a charm to any pieces… and it’s a really neat fix for piece of glass! 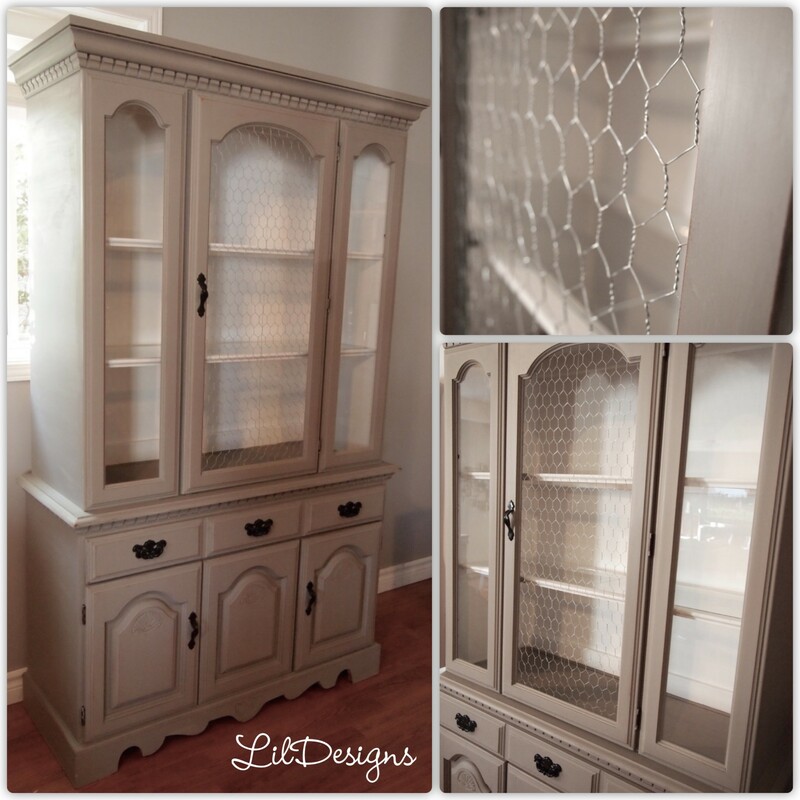 I had this China Hutch for a while and couldn’t decide on the colour combinations I wanted to use. Dark with light interior? Gray? Charcoal? I knew I wanted a white interior but as I like to say, the piece had to speak to me. So it took a while… Or… I kinda procrastinated. Finally… I decided on the French Linen Gray from Annie Sloan with a Pure White interior. I thought it would be great with the hutch built-in interior lighting. Don’t you just love the country chic of this piece? If you’re interested in purchasing this piece, feel free to contact me! This entry was posted in Crafts & DIY and tagged ascp, chicken wire, china hutch, French Linen, furniture, galvanized, glass, hutch, waxed. The Nursery project was so much fun to do for these awesome friends that I had to make them a little thank you gift. There’s this Napoleon Bonaparte quote that I love and think is beautiful for a little girl and I’ve been dying to add it in a project somehow. Everyone has really old frames with old pictures that don’t fit any decor colours or are just tucked away collecting dust. Well, dust them off and re-purpose them! I started with repainting an old wooden frame with some left over paint from the Nursery project and distressed it to add character. 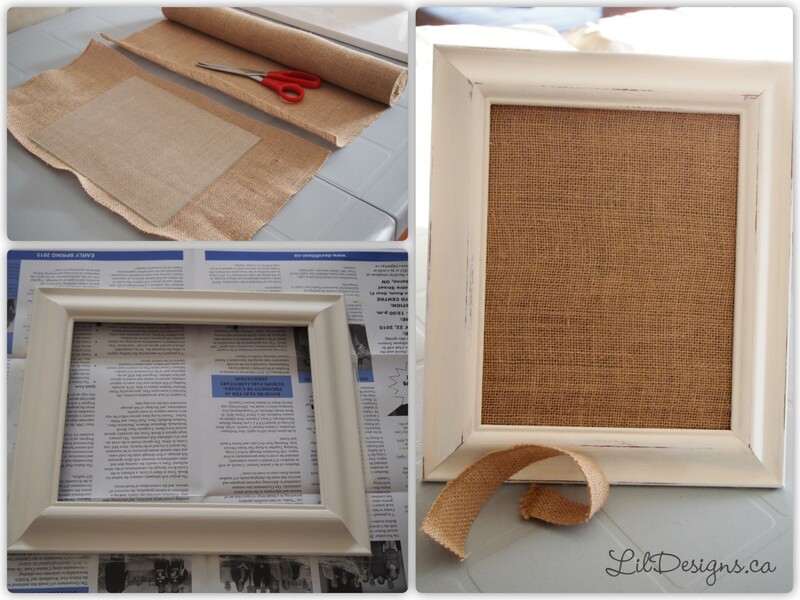 I then cut the burlap and fit over the glass piece front of the photo frame. Then I just painted the quote onto the burlap with some acrylic paint… added little glue on diamonds all over to accent the piece. 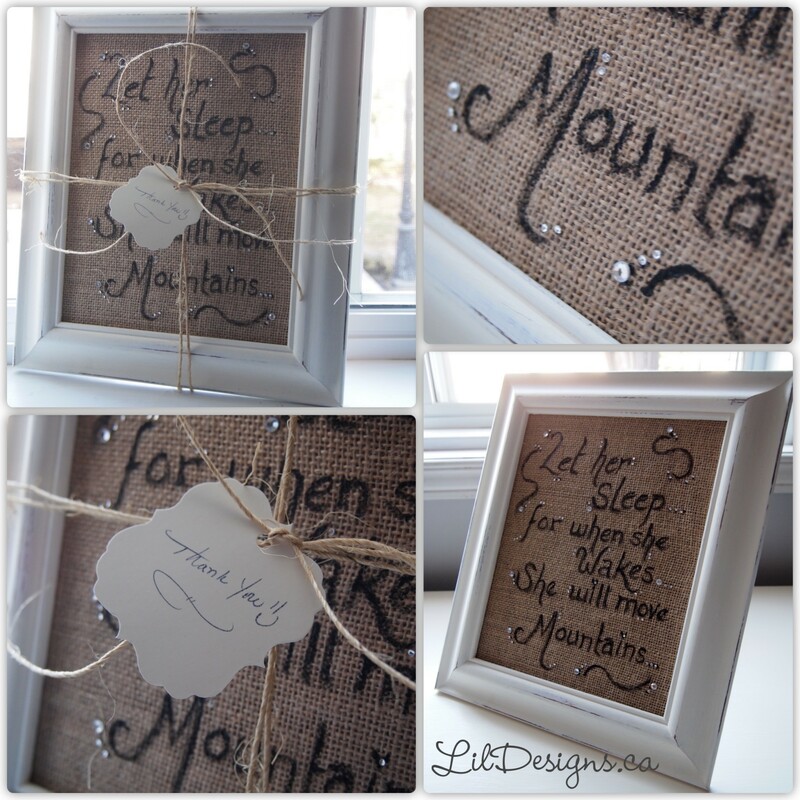 This entry was posted in Crafts & DIY and tagged CeCe Caldwell, chalk paint, frame, let her sleep, napoleon, thank you, twine.